In 1969, the DARK SHADOWS marketing machine was still going strong. Toys, trading cards, posters, pop music ... if you could slap a pair of fangs or sideburns on it, Dan Curtis would find a way to sell it. A year later that machine appears to have come to a grinding halt. Even with the national boost provided by MGM's HOUSE OF DARK SHADOWS, the previous year's flood of merchandise had become a desert. While the Marilyn Ross novels and Gold Key comics continued to exist within their own little worlds, no new trading cards, ViewMaster reels or much of anything else were produced for either the television show or feature film. Robert Cobert's "Ode to Angelique" proved to be a flop on the charts, and it would be decades before his scores for HOUSE and NIGHT OF DARK SHADOWS would be released. DARK SHADOWS was a certified Cultural Phenomenon TM, but it was essentially a mom-and-pop operation. Dan Curtis Productions could only handle so much responsiblity, it seems, and the weight of simultaneously producing a daily television show and two feature films was probably too much for it to carry. I've spent the last six years occasionally filling in those merchandising gaps. Way back in 2012 I envisioned series of trading cards for both HOUSE and NIGHT, going so far as to even design wax wrappers for these imaginary products. (I also made a digital set cards for the 1991 revival series.) 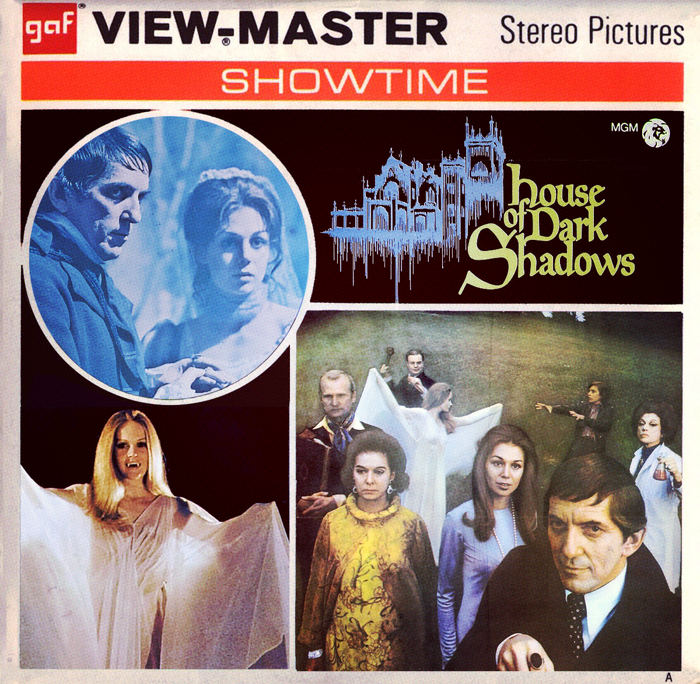 But the absence of a set of ViewMaster reels for HOUSE OF DARK SHADOWS has always bothered me. But merely designing a package for the reels seemed ... lazy? Was it possible to take this idea another step further? Below, you'll see the end result. The idea was to create fake stereoscopic images, animated in a way to give them the illusion of depth you'd get from a ViewMaster reel. For a film shot in 1970 the photography in HOUSE OF DARK SHADOWS is surprisingly spry, giving me only a few scenes from which to pull. I've got some doubts that these really work, but a poll of my Twitter peeps seemed favorable. If this post gets a good response, I might take a shot at NIGHT OF DARK SHADOWS ... or even some of the television episodes.